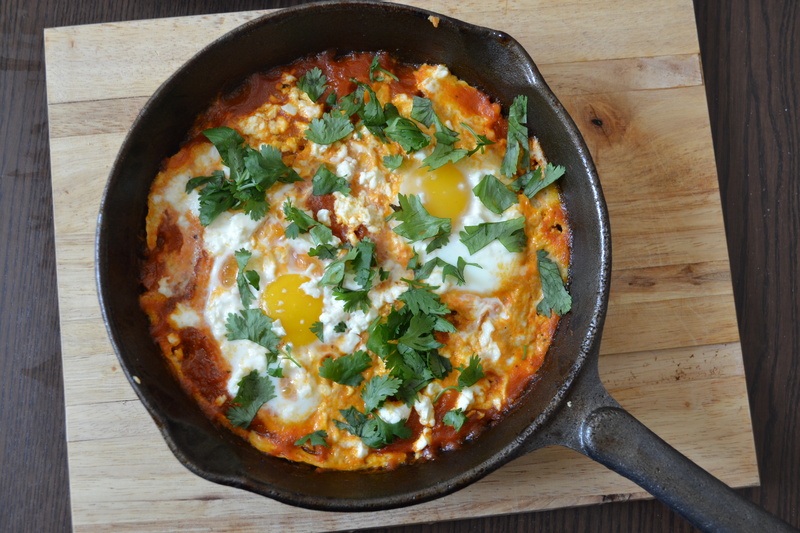 Food trend alert: shakshuka. I’ve seen this traditionally Middle Eastern egg dish popping up everywhere. I first laid eyes on it on Instagram; someone leaning over the stove, wearing an apron, cracking eggs into a pan of tomato sauce. I was insta-trigued – what was this mystery dish? Then I spotted it again, this time on Plated’s Instagram feed, and finally learned what the dish actually was. 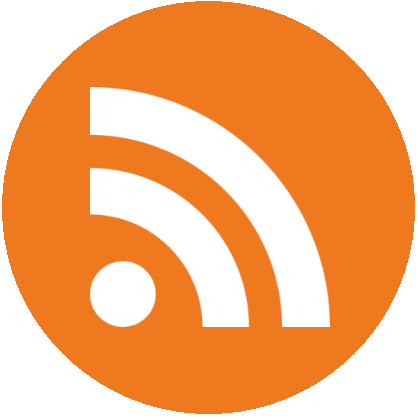 Then, a girlfriend forwarded me this New York Time’s article, saying that she and her boyfriend had made it over the weekend (while reading the Financial Times and drinking mimosas – so posh). I was convinced – had to try it. Because I hate following recipes, I made my own version. Since I was in tomato overload last week, I had a low bar for giving this recipe a try – what else was I to do with all of that tomato sauce? I instantly realized that the hype was real. This dish is easy to prepare, hearty, and can hold up at any time of day. I made it for dinner last night and it was great. I have no idea what a traditional Shakshuka chef would say about this recipe, but it worked for me. (According to Wikipedia, variations of this dish are popular in Moroccan, Algerian, Israeli, Egyptian, Libya, and Tunisian cuisines. As described in the New York Times article, it’s often served at Passover.) The feta added a saltiness to the tomato sauce that was countered perfectly by the cilantro, and the eggs melted in my mouth since they were poached slowly in the sauce. YUM. Yield: 1 serving. Per Serving: $5.88, 362 calories, 13g fat, 27g carbs, 16g protein. Preheat oven to 350 degrees Fahrenheit. Heat up 1.5 cups of tomato sauce (I used my basic tomato sauce made with farm fresh heirloom tomatoes) in an oven proof saute pan (I used cast iron, but a stainless steel can work too). Use a smaller sized pan so the tomato sauce is at least half an inch deep and fills the bottom of the pan. If you don’t have a smaller pan, double the recipe (the more, the merrier). When the sauce is warm and starts to bubble, crack two eggs into opposite sides of the pan Turn off the heat and top with 2 ounces crumbled feta cheese. Put the pan in the oven and bake for 7-10 minutes. Keep an eye on it and take it out when the eggs are cooked to your liking (I like medium cooked yolks, so I took it out around 9 minutes). Let cool for 5-10 minutes, top with 2 tablespoons chopped cilantro, and serve with crusty bread or a toasted English muffin. When you find a good recipe, you do everything you can with it. 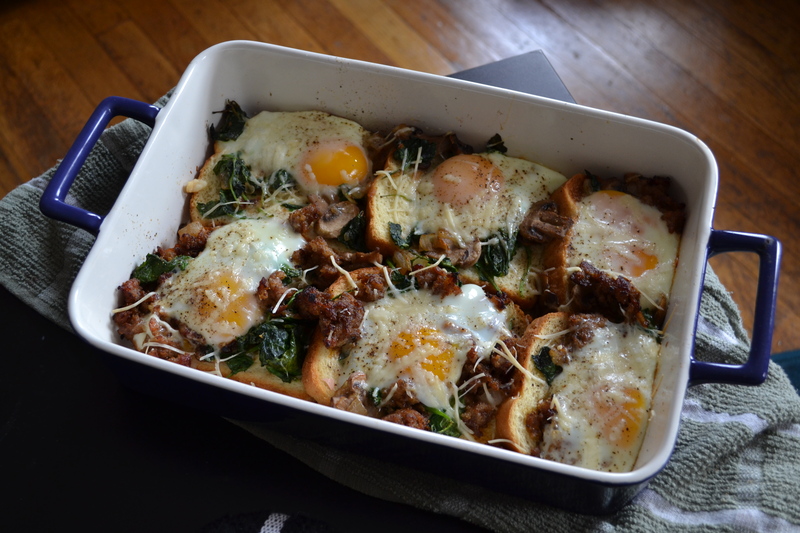 That’s what happened with my Baked Eggs with Kale and Sausage from a few weeks ago. Before I had even finished the first batch I was already thinking of new variations to try! 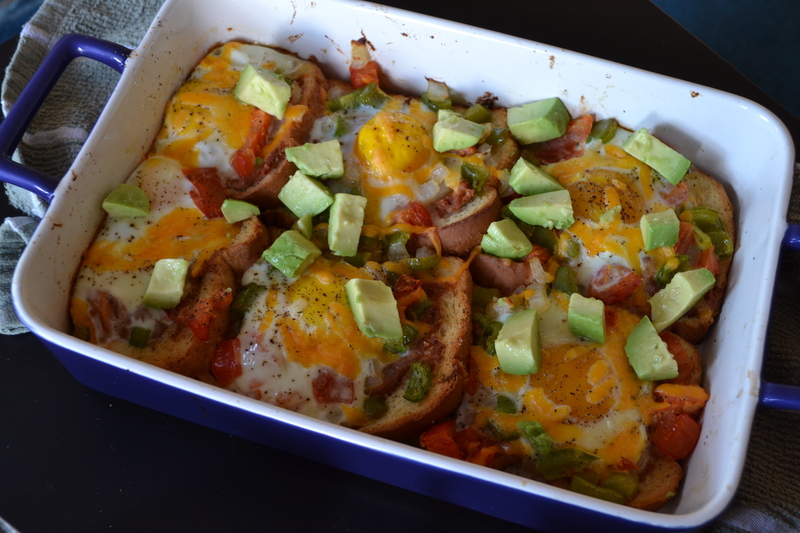 This Mexican version is another great brunch recipe – I can’t wait for the next version! Lightly toast 6 slices bread. I laid them out on a baking pan and put them in the oven at 350 degrees for 5 minutes, flipping once. Spray a casserole dish with cooking spray and arrange the bread on the bottom, slightly overlapping. Top each with 2 tablespoons refried beans. Preheat oven to 400 degrees Fahrenheit. Sauté ½ cup diced onion in 1 teaspoon olive oil. When the onions are translucent, add ½ green bell pepper diced and 1 diced medium tomato. Put the onion, tomato, and pepper mixture over the bread in an even layer. Crack 1 egg on each slice of bread (6 eggs total) and sprinkle with salt and pepper. You may need to arrange the vegetables to make a little spot for the egg to fit, so it doesn’t slide off into the casserole dish. Pour 1/3 cup milk over everything to keep it moist, and sprinkle with ¼ cup cheddar cheese. Bake in oven for 15 minutes, longer or shorter depending on how you like your eggs. Top with fresh diced avocado and enjoy! Yield: 6 servings. Per Serving: $1.45, 273 calories, 12g fat, 29g carbs, 14g protein. We have a runner up for the most beautiful plate of food I’ve ever photographed (in first place, surf and turf from my summer vacation on Cape Cod). I had the pleasure of entertaining a few of my lovely lady friends for brunch this past Sunday. I had a few recipes I wanted to try and needed a taste testers, plus I love being in the company of these girls! You can’t have a bad meal with great company, so all in all it was a brunch success. In addition to this baked egg casserole (which was a hit) we had an oven baked pancake (recipe coming soon), Bloody Mary’s, and delicious cupcakes-disguised-as-muffins for dessert. Adapted from a recipe from the Food Network, this is an elegant meal you could eat for brunch or dinner. I can’t wait to make and share some variations! Lightly toast 6 slices bread. I laid them out on a baking pan and put them in the oven at 350 degrees for 5 minutes, flipping once. Spray a casserole dish with cooking spray and arrange the bread on the bottom, slightly overlapping. Preheat oven to 400 degrees Fahrenheit. Sauté ½ cup diced onion in 1 teaspoon olive oil. When the onions are translucent, add 1 cup sliced mushrooms and sauté until brown. Add 2 cups baby kale and sauté until wilted. Meanwhile, brown 2 hot Italian sausage links, cases removed, in a small sauté pan. You could put the sausage in with the onions mixture, but I kept them separate so I could make a few eggs without sausage for my girlfriends. Put the kale mixture and sausage over the bread in an even layer. Crack 1 egg on each slice of bread (6 eggs total) and sprinkle with salt and pepper. You may need to arrange the kale and sausage to make a little spot for the egg to fit, so it doesn’t slide off into the casserole dish. Pour 1/3 cup milk over everything to keep it moist, and sprinkle with 2 tablespoons parmesan cheese. Bake in oven for 15 minutes, longer or shorter depending on how you like your eggs. I baked mine for 20 minutes and the yolks were medium/hard. I love runny yolks so I’ll take them out sooner next time! Yield: 6 servings. Per Serving: $1.20, 236 calories, 11g fat, 21g carbs, 15g protein. I’m not a natural morning person. That being said, I’ve been known to wake up at 5:15 AM to get to the gym before work. It’s not easy (or pretty) and many mornings I decide sleep is more important. One of my secrets: preparing an easy and delicious breakfast in advance. 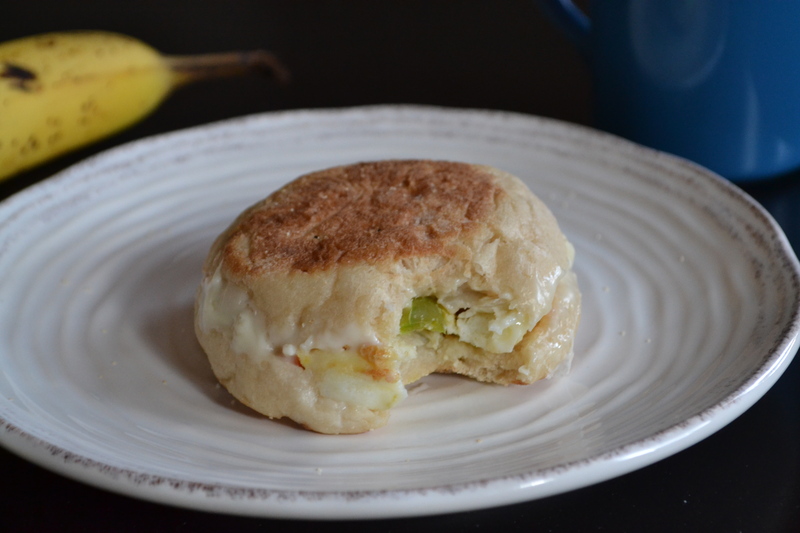 Nothing could be easier than these frozen egg sandwiches – they reheat in just 2 minutes and taste great. You can customize them with whatever makes you most likely to get out of bed in the morning – instead of these veggies, mix in extra cheese, bacon or ham, or spinach. Dice ½ green bell pepper, ½ medium onion, and 1 medium tomato. Heat oven to 350 degrees Fahrenheit. Spray a large muffin tin (one that holds 6 muffins) with cooking spray. Crack 1 large egg into each cup. Lightly break the yolk of each egg with a fork. Divide the veggie mix among the cups. Slice open 6 English muffins and place on a baking sheet slice side down. When the oven is preheated, put in the eggs and English muffins. After 5 minutes, flip the English muffins. After 5 more minutes (10 minutes total), take out the English muffins and run a spatula or knife around the outside of the eggs. After 10 more minutes (20 minutes total), take out the eggs. The center should be cooked through and not runny. Let the muffins and eggs cool for about 5 minutes. Remove the eggs from the muffin tin by running a knife around the outside of each egg and using a spatula to lift gently out of the tin. Assemble the sandwiches using 1 piece of American cheese for each sandwich. Wrap the sandwiches tightly in plastic wrap and store in the freezer. To reheat, remove plastic wrap, wrap in a paper towel, and microwave on high for 2 minutes or until warmed through. Yield: 6 servings. Serving size: 1 sandwich. Per Serving: $1.16, 252 calories, 9g fat, 29g carbs, 16g protein.